Many wonderful theories that explain the evolution of the universe fail because they predict more dark matter than is actually out there. Now a new paper proposes one event in the early universe that would reduce the amount of dark matter in all the theories. In the first fractions of a second after the Big Bang, most cosmologists think that the universe went through a period of rapid sudden expansion, dubbed inflation, also lasting for mere fractions of a second. Expansion continued at a slower rate after that, and our universe is still expanding today (although that expansion is now accelerating). But something is missing. When astronomers look at galaxies spinning, for example, they notice that the rate at which the galaxies are spinning only makes sense if the galaxies are carrying a lot more mass than what we can observe directly. All over the universe, objects are moving as if they are under the gravitational influence of vast quantities of invisible mass. This has been dubbed dark matter. While physicists aren’t sure exactly what the dark matter is, they do know it has a gravitational effect on the universe, without seeming to interact with ordinary matter. Although there is about five times more dark matter than regular matter, there is still much less than many theories about the universe predict. Any theory has to account for the present state of that universe, yet several predict more dark matter than we actually see. A new paper by Hooman Davoudiasl, Dan Hooper, and Sam McDermott appeared today in Physical Review Letters, and attempts to find an explanation by proposing what they call “inflatable dark matter”. In the early universe, the state of matter and dark matter was in flux. “Matter and anti-matter annihilated,” Davoudiasl explained to Gizmodo. But for some reason, there was slightly more matter than antimatter, so we ended up with a slight surplus of matter in the universe. That accounts for all the visible structures we see today. At some point after the inflationary period, the authors believe that the amount of dark matter in the universe was set, or, as Davoudiasl put it, “baked in the cake”. The annihilations stopped, the universe continued to expand (albeit more slowly), and the proportions of dark matter and regular matter in the universe were set. However, those annihilations depend on the properties of dark matter and visible matter. As these properties have become more well-known, the density of dark matter that many theories predict, and the density we actually see, don’t match up. “As experiments get more sensitive, they put ever more stringent bounds on the interactions of dark matter and the visible particles,” Davoudiasl explained. Experiments show that the interactions between dark matter particles are very weak. Many theories which take these interactions into account, then, predict a universe in which there are far more dark matter particles per unit of volume than astrophysicists actually observe. How to solve this? The paper suggests there could have been a secondary period of extreme inflation. This would dilute the abundance of dark matter per unit of volume. 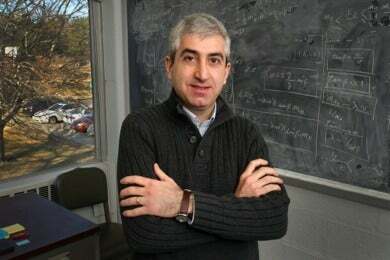 As long as it happened “no later than about one second into the Big Bang, it could potentially be part of a consistent history of the early universe,” said Davoudiasl. So after the universe went through especially rapid expansion once, the annihilations stopped, and the proportion of dark matter was set. Then the universe rapidly expanded again, producing ordinary matter, but not dark matter. This brought the proportion of dark matter down to a point where the theories explaining the workings of the universe match up with the density of dark matter observed in the actual universe. But what caused this second inflationary period? Davoudiasl believes that it could have been a “hidden sector” of physics. Currently, we have what’s known as the Standard Model of particle physics, which includes all the known particles like quarks and the electron, as well as the forces that govern them.